A goitre refers to an abnormal enlargement of your thyroid. When you look in the mirror you may notice a lump around your throat, or a visible band of swelling around the base of your neck. Women over 40 are at far greater risk of developing a goitre. Secondary hypothyroid symptoms are common as a goitre will reduce healthy thyroid function. + Worldwide a goitre is one of the earliest and most visible signs of an iodine deficiency. + If you are not low in iodine then the formation of a goitre could be due to a thyroid autoimmune disorder such as Hashimoto’s thyroiditis. + A goitre can also be due to nodules growing on the thyroid and in some circumstances a goitre can develop due to thyroid cancer. Any type of abnormal swelling in the neck or throat should be checked by your doctor. Your doctor will do a physical examination and order blood tests to check your thyroid hormone levels. They may also recommend an iodine clearance test. Due to the limitations of a physical examination most doctors refer patients to an imaging clinic for a thyroid ultrasound. 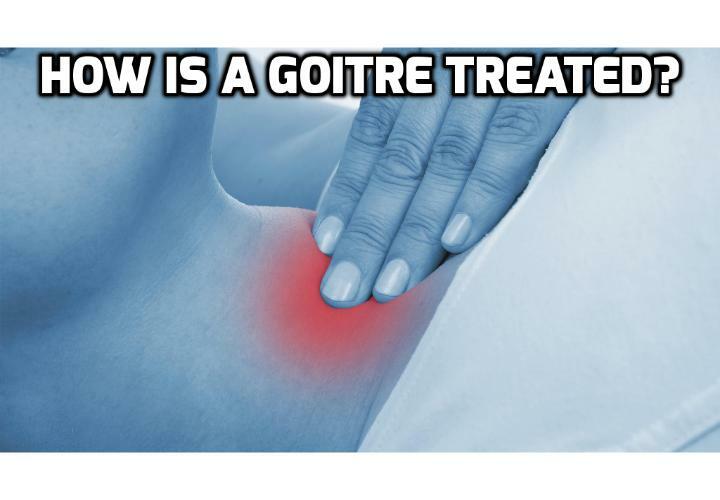 How is a goitre treated? Treatment depends on the extent of the swelling, your symptoms and the underlying cause. Uncovering the cause is very important so you can commence with the most appropriate treatment. + ‘Watchful waiting’. If the goitre is small and not bothering you it’s likely your doctor will not recommend any type of treatment and instead opt to for regular monitoring. However it is a very good idea to get proactive and find effective ways to deal with the underlying cause. + Thyroid medication. Thyroid hormone replacement therapy is commonly prescribed to treat the associated hypothyroid symptoms. Thyroxine is the most widely prescribed medication to treat low thyroid function. It is a synthetic form of thyroxine (T4). + Iodine supplementation. Iodine is prescribed if the goitre is due to an iodine deficiency. Low iodine intake causes enlargement of the thyroid. A good quality iodine supplement is an effective strategy to reduce thyroid swelling. + Biopsy. A biopsy sample of your thyroid tissue may be required if there are large nodules within the thyroid. A biopsy is taken to also rule out thyroid cancer. + Surgery. Removal of the thyroid may be recommended if the goitre is large and causing difficulty with breathing and swallowing. If all of the thyroid is removed you will need to take thyroid hormone replacement therapy for the rest of your life. + Avoid dietary goitrogens. Some foods contain substances that interfere with uptake of iodine by the thyroid and are therefore known as goitrogens. The term is derived from the word ‘goitre’. Soy, millet and cruciferous vegetables such as cabbage, Brussels sprouts, turnips, bok choy, kale, cauliflower and broccoli are the most common. In their raw state these vegetables are very goitrogenic. + Eat a wholesome, thyroid nourishing diet. Fresh, natural foods supply a wide range of nutrients to help you recover your thyroid health. + Avoid thyroid disrupting toxins. Ongoing research reveals toxic environmental chemicals pose a serious threat to your thyroid health. + Filter your water. Most urban water supplies have fluoride-like compounds added in. Fluoride blocks thyroid function and is best illustrated by the fact that it is used as a thyroid suppressing medication for hyperthyroid conditions. Why Soy Foods Should Be Avoided if You Have Thyroid Disorder? Why Cruciferous Vegetables Should Be Strictly avoided if you have Thyroid Problems? Previous PostPrevious Why Cruciferous Vegetables Should Be Strictly avoided if you have Thyroid Problems?